Dance with a Poor Man's daughter is the story of one of the "coloured" families forced to relocate from the Cape Town area known as District Six in South Africa during apartheid, told through the eyes of a little girl. Lily lives with her grand mother, her aunt Stella and uncle Gus-Seep (that is how she calls and spells his name). Her mother Gloria left for Johannesburg because the valley is too small for her. Lily loves her grandmother more than she loves her mother, which she makes clear. 'You don't always like your mother as much as you would like to, do you Lily?' he says and I don't even have to answer him because he knows it's true. seven generation of her ancestors were born and bred isn't taken away from them and given to the white citizens of South Africa. "My story will be that my mother was a woman of courage. When times were bad she stood up to be counted and didn't mind how much it cost her and we both know it cost her a very great deal, more than some other people, who were not as strong as my mother, might be willing to pay". This novel isn't political at all, it is the trauma of a family, of men, women and children who went through the painful ordeal of being uprooted from their homes told through the voice of a child. Lily's account is clear and detailed, there is no way you won't understand what she is talking about. "I watch the river going by and I say I'll think about it but I know about "think about it". 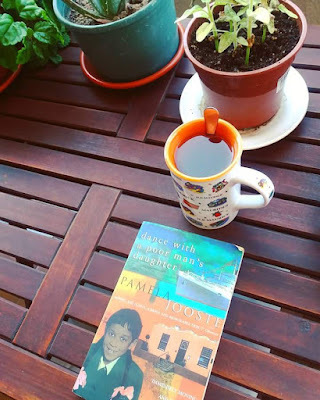 Grown-ups say that to children to make make themselves feel better when it's not good news and everything is already decided and there's really nothing to think about at all"
Dance with a Poor Man's Daughter is a novel that I highly enjoyed and recommend. It is a sad and a hopeful read, a novel about individuals and their struggles. Lily's mother Gloria was born in a time of lost opportunities, a smart and intelligent woman who couldn't accomplish her goals because she was "coloured" and therefore limited by law under the apartheid government of South Africa. This novel is intense and moving. I had to hold my tears back after reading the last page, I think it is one of the saddest novels I have ever read so far, it keeps on coming back to me even days after reading and my heart continues to stand still no matter how many times I re-read the epilogue. This novel is part of my Commonwealth Writers Prize for Africa Region Winners Reading Challenge. It won Commonwealth Writers' Prize for Best First Book in Africa (1998).